Jejune's Place: Socks, socks, socks, is that ALL you think about?! Socks, socks, socks, is that ALL you think about?! This is what I ordered from Germany, and she kindly found and ferried home, fending off the advances of feral knitters far and wide! 2 balls of Geniale by Schachenmayr nomotta. It's 50% merino 50% acrylic, and is basically a knitted tape. I love the olive green - purple - blue colours. This is a trick inclusion - no, it's NOT sock yarn! The Opal looks innocuous, but is in fact CRAZY yarn. The socks will knit up looking as if there's cool tyre tracks printed on top of the base pattern. Opal Crazy, Colour 1904. I am actually making some progress on my mother's vest again. I must admit I don't much like this yarn, it sheds fibres over me while I'm knitting. But I shall persevere. 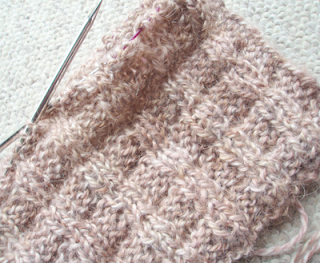 The pattern is pretty easy to remember, so it's good TV knitting. In breaking news - Lulu has got out at Craft ACT, and tried to make off with a necklace (I think it's one of Olivia's creations)! You have to check it out... I'm still laughing! Love that Regia yarn - maybe you buy a contrast plain yarn and do mosaic socks (which I'd love to try one day!). I've been wondering how you've coped without Lulu - you are probably glad to have a little break from her antics!! ooh lucky jejune! I cant wait to see how that crazy Opal works out, have been watching it from afar in a state of curiousity. Oh wow, what fantastic sock wool!!! The crazy is, well, crazy!! I will wait impatiently to see it knitted up!!! I didn't know they could do sock wool like that! Clever, clever people! Can't wait to see it all made up. I also can't wait to finish off my current rounds of WIPs so that I can start the lacy scarf with my silky Regia wool from Georgie. It's yummy stuff. Oh, that naughty lamb! Her undercover trick was my favorite! The sock yarn is to envy! I can definitely see the Regia used Faire Isle style with a solid or two. Happy knitting! I love the vest color and pattern. It is so feminine and soft looking. 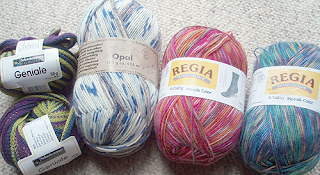 Opal makes such neat yarns if you want fun socks. My first pair of socks was knit with one of their self striping yarns and I didn't know it was self striping and was impressed all the way through the sock knitting process. I thought that I could be good and not purchase any more sock yarn for a while.....Now just look what you've done....Now I'll have to go wool shop hopping to see if I can find any of that Opal Crazy sock yarn. Can I knit it all at once?